The name Jerry Lee Lewis has become synonymous with rock 'n' roll, and the attitude that defines it. His awe-inspiring talent and wild man reputation have made him one of the most talked-about entertainers in history. 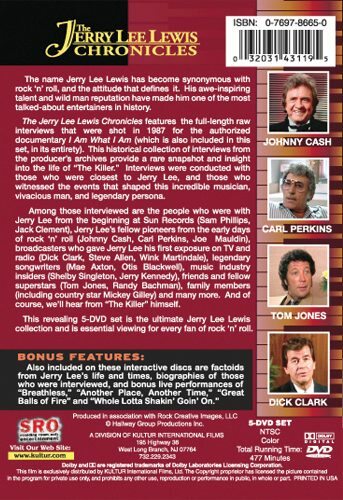 This historical collection of interviews from the producers' archives provides a rare snapshot and insight into the life of "The Killer." Interviews were conducted with those who were closest to Jerry Lee, and those who witnessed the events that shaped this incredible musician, vivacious man, and legendary persona. 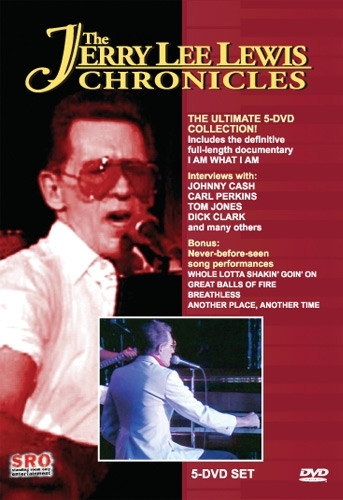 Included on these interactive discs are factoids from Jerry Lee's life and times, biographies of those who were interviewed, and bonus live performances of "Breathless," "Another Place, Another Time," "Great Balls of Fire," and "Whole Lotta Shakin' Going On,"
Also includes: The Definitive Documentary "I AM WHAT I AM." This is a 5 DVD set!